The two men are John Davies (forefront) and Will Davies of Cenarth; the last two legitimate coracle fishermen in Cenarth. The coracle is a small, rounded, lightweight boat of the sort traditionally used in Wales, and also in parts of the West Country and in Ireland, particularly the River Boyne, and in Scotland, particularly the River Spey. The word is also used of similar boats found in India, Vietnam, Iraq and Tibet. The word "coracle" is an English spelling of the original Welsh cwrwgl, cognate with Irish and Scottish Gaelic currach, and is recorded in English text as early as the sixteenth century. Other historical English spellings include corougle, corracle, curricle and coricle. The structure is made of a framework of split and interwoven willow rods, tied with willow bark. The outer layer was originally an animal skin such as horse or bullock hide (corium), with a thin layer of tar to waterproof it – today replaced by tarred calico, canvas, or fibreglass. The Vietnamese/Asian version of the coracle is made of interwoven bamboo and waterproofed by using resin and coconut oil. Oval in shape and very similar to half a walnut shell, the coracle has a keel-less flat bottom to evenly spread the load across the structure and to reduce the required depth of water – often to only a few inches. This makes it ideal for use on rivers. Each coracle is tailored to the local river conditions. In general there is one design per river, but this is not always the case. The Teifi coracle, for instance, is flat-bottomed, as it is designed to negotiate shallow rapids, common on the river in the summer, while the Carmarthen coracle is rounder and deeper, because it is used in tidal waters on the Tywi, where there are no rapids. Teifi coracles are made from locally harvested wood – willow for the laths (body of the boat), hazel for the weave (Y bleth in Welsh – the bit round the top) – while Tywi coracles have been made from sawn ash for a long time. The working boats tend to be made from fibreglass these days. Teifi coracles use no nails, relying on the interweaving of the laths for structural coherence, whilst the Carmarthen ones use copper nails and no interweaving. They are an effective fishing vessel because, when powered by a skilled person, they hardly disturb the water or the fish, and they can be easily manoeuvred with one arm, while the other arm tends to the net; two coracles to a net. The coracle is propelled by means of a broad-bladed paddle, which traditionally varies in design between different rivers. It is used in a sculling action, the blade describing a figure-of-eight pattern in the water. The paddle is used towards the front of the coracle, pulling the boat forward, with the paddler facing in the direction of travel. The Welsh Coracle is intended to be carried on the back; Welsh saying is Llwyth dyn ei gorwgl (load of a man is his coracle). Designed for use in swiftly flowing streams, the coracle has been in use in the British Isles for millennia, having been noted by Julius Caesar in his invasion of Britain in the mid first century BC, and used in his military campaigns in Spain. Remains interpreted as a possible coracle were found in an Early Bronze Age grave at Barns Farm near Dalgety Bay, and others have been described, from Corbridge and from near North Ferriby. Where coracle fishing is performed by two coraclers the net is stretched across the river between the two coracles. The coraclers will paddle one handed, dragging the net in the other, and draw the net downstream. When a fish is caught, each hauls up an end of the net until the two boats are brought to touch, and the fish is then secured, using a priest (or knocker – a small block of wood) to stun the fish. 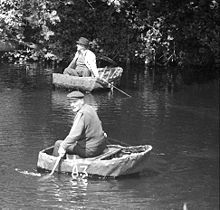 In the 1920s and 30s James Hornell visited hundreds of rivers in the British Isles to talk with remaining coracle makers and users. He documented the tradition in his book British Coracles and the Curraghs of Ireland (The Society for Nautical Research, 1938) containing drawings, diagrams and construction details gleaned from regular makers. Coracles are now seen regularly only in tourist areas of West Wales, and irregularly in Shropshire on the River Severn – a public house in Sundorne, Shrewsbury called "The Coracle" has a pub sign featuring a man using a coracle on a river. The Welsh Rivers Teifi and Tywi are the most common places to find coracles in Wales. On the Teifi they are most frequently seen between Cenarth, and Cilgerran and the village of Llechryd. In 1974, a Welsh coracle piloted by Bernard Thomas (~1923–2014) of Llechryd crossed the English Channel to France in ​13 1⁄2 hours. The journey was undertaken to demonstrate how the Bull Boats of the Mandan Indians of North Dakota could have been copied from coracles introduced by Prince Madog in the 12th century. To promote demonstrations, courses, exhibitions, discussions and lectures relating to coracles. The current president of the Society is Irving Finkel, Assistant Keeper in the Department if the Middle East at the British Museum, who is known for decoding a cuneiform tablet detailing Noah's Ark – the description of which resembles a very large coracle. The current Society chairperson is Jude Pilgrim, a committee member of the Heritage Lottery Fund. She recently played an instrumental part in setting up the Ironbridge Coracle Trust, formed to save the Eustace Rogers coracle hut in Ironbridge from demolition. There are many Society members across the country who demonstrate at events and/or run coracle building courses, helping meet the Society's founding aims. A list of some of this year's events can be found on the official Coracle Society website. The Society was present at the 2005 Shrewsbury River Festival, where they displayed various coracles on the River Severn. There is also an annual coracle regatta held in Ironbridge on the August Bank Holiday Monday every year. Organised by the Green Wood Centre until 2014 and the Ironbridge Coracle Trust from 2015, it is run on an informal basis whereby anyone with a coracle can take part in the event. Each year new entrants come with coracles made on the Bank Holiday weekend at the Green Wood Centre. Members of the Society support the annual world championship coracle races in Shrewsbury, which raises funds in support of Macmillan Cancer Support. In 2010, the Society celebrated its 20th anniversary with a number of events, including a morning of talks at the National Coracle Centre in Cenarth. In 2015, the Society celebrated its 25th anniversary at its founding home of St Fagans National History Museum. Events included a talk from Irving Finkel about his experiences decoding the Noah tablet and making the accompanying Channel 4 documentary. The Society also supported the return of coracles and coracle regattas to Welshpool in 2015. The design of the coracle makes it an unstable craft. Because it sits "on" the water, rather than "in" it, the vessel can easily be carried by currents and the wind. The Coracle Society has published guidelines for safely using coracles. The oldest instructions yet found for construction of a coracle are contained in precise directions on a four-thousand-year-old cuneiform tablet supposedly dictated by the Mesopotamian god Enki to Atra-Hasis on how to build a round "ark". The tablet is about 2,250 years older than previously discovered accounts of flood myths, none of which contain such details. These instructions depict a vessel that is today known as a quffa, or Iraqi coracle. Many scholars believe that the basket that baby Moses was cast adrift in on the Nile (in Exodus 2:3) was in fact a coracle or quffa, based on the similarity of that passage to Neo-Assyrian legends depicting infants cast adrift on rivers in quffas. The curach or boat of leather and wicker may seem to moderns a very unsafe vehicle, to trust to tempestuous seas, yet our forefathers fearlessly committed themselves in these slight vehicles to the mercy of the most violent weather. They were once much in use in the Western Isles of Scotland, and are still found in Wales. The framework [in Gaelic] is called crannghail, a word now used in Uist to signify a frail boat. Indian coracles (Tamil:பரிசல் (parical), Kannada:ಹರಗೋಲು,ತೆಪ್ಪ, (Haragōlu, tep - "crab")) are commonly found on the rivers Kaveri and Tungabhadra in Southern India. Coracles are primitive, light, bowl-shaped boats with a frame of woven grasses, reeds, or saplings covered with hides. Indian coracles are considered to have been in existence since prehistoric times, and are a major tourist attraction at the Hogenakkal falls on the Kaveri river. Although these boats were originally designed for general transport, they have recently been used mostly for giving tourists rides. The coracles found in the Hogenakkal are of two types, which differ mainly in size. The smaller ones are about 6.2 feet (1.9 metres) in diameter, and are used primarily for fishing. The larger ones, which measure up to 8.4 feet (2.6 metres) in diameter, are used for tourists. Indian coracles are either saucer or bowl shaped and circular, with the greatest diameter across the mouth. The circular coracles in Iraq are very similar, but they have convexly curved sides, and thus the mouth is not the widest part. Indian coracles are on average about 7.3 feet (2.24 metres) in diameter, but can still hold eight people at a time. Other kinds of coracles usually can only hold one person. Indian coracles, and coracles in general, are made of bamboo and take about a day to build, given all the necessary materials. The bottoms of the boats are covered in hides, or sometimes with sheets of plastic, in order to make them waterproof. In modern times, a sheet of LDPE plastic is often embedded between two layers of bamboo. Sometimes the bottom of the craft is tarred to make it waterproof. Coracles are steered and propelled using a single paddle from the front of the boat in the direction of travel, making them unique. The boats are made primarily from bamboo. The first step in construction is a basic framework woven from bamboo sticks. Then the bottom is further reinforced with the addition of more bamboo sticks, making the boat's base sturdy. Once the bottom is structurally sound, the lowest points of the sides are defined by a circumferential band of three flat strips of bamboo woven into the existing lattice. The sides of the boat are then made with 20 to 30 adjacent strips of bamboo. Finally this framework is again strengthened by lightweight bamboo, making sure that the sides are not heavier than the base. The boats had earlier been waterproofed by using hides of animals, but these days plastic sheets are used for this purpose as they are cheaper as well as easily available. The waterproofing is further enhanced by a layer of tar, a feature which is common in most contemporary coracles. Iraqi coracles, called quffa or kuphar (Arabic: قفة), have been used as ferries, lighters, fishing vessels, and water taxis on the Tigris and Euphrates rivers since at least the 9th century BC. They share details with the myriad types of coracle used across Eurasia. Modern quffas can be up to 18 feet (5.5 m) in diameter and carry four to five tons. Modern quffas are of similar size and construction as their ancient counterparts, with both being made from woven bundles of reeds or basketry waterproofed with bitumen. ^ "Definition of coracle". Collins English Dictionary. 2012. ^ Evans, E. Estyn (2000). Irish Folk Ways. Courier Dover Publications. p. 233. ISBN 978-0-486-41440-9. Chisholm, Hugh, ed. (1911). "Coracle" . Encyclopædia Britannica (11th ed.). Cambridge University Press. ^ Fagan, Brian M. (2004). The Seventy Great Inventions of the Ancient World. Thames & Hudson. ISBN 0-500-05130-5. ^ "Plywood lath coracle - Free Boat Plans". koti.kapsi.fi. ^ "Death of a river legend". Tivyside Advertiser. 7 September 2014. Retrieved 5 May 2015. ^ Chivers, Tom (21 June 2018). "Irving Finkel: reader of the lost Ark" – via www.telegraph.co.uk. ^ "England's 'last' coracle shed saved". 2 August 2015 – via www.bbc.co.uk. ^ "Welshpool regatta - The Coracle Society". www.coraclesociety.org.uk. ^ Gabrielle Jonas (28 January 2014). "Noah's Ark Was Round, Based On 4,000-Year-Old Mesopotamian Instructions That Are 'Mathematically Accurate'". International Science Times. Archived from the original on 4 March 2014. Retrieved March 4, 2014. Four thousand-year-old cuneiform instructions on how to build a round "Noah's ark" have turned out to be mathematically on-target, the British Museum curator who translated the text told the International Science Times Monday. ^ Potts, Daniel T. (21 May 2012). A Companion to the Archaeology of the Ancient Near East. John Wiley & Sons. ISBN 9781405189880. ^ "Coracles: The surprising history of Britain's strangest boat". BBC one. BBC. Retrieved 14 June 2018. ^ Dwelly, William Robertson, Michael Bauer, Edward. "Dwelly-d - Dwelly's Classic Scottish Gaelic Dictionary". www.dwelly.info. ^ a b Hornell, James (21 June 2018). "165. The Coracles of South India". Man. 33: 157–160. doi:10.2307/2790095. JSTOR 2790095. ^ a b "Encyclopædia Britannica - Coracle". Britannica.com. Retrieved 31 January 2013. ^ a b c d e f g h i Boats of South Asia- by Sean McGrail el al. Books.google.com. Retrieved 31 January 2013. ^ a b "The Coracle - a one person boat with an ancient lineage". Data-wales.co.uk. Archived from the original on 2 November 1996. Retrieved 31 January 2013. ^ "Hide boats at Hogenakal on the river Kaveri, Tamil Nadu- by C Palmer et al". Cat.inist.fr. Retrieved 31 January 2013. ^ "Hogenakkal falls". Ecoindia.com. Retrieved 31 January 2013. ^ Agius, Dionisius A. (2008). Classic Ships of Islam: From Mesopotamia to the Indian Ocean. BRILL. p. 130. ISBN 9789004158634. ^ Hornell, James (11 February 1939). "British Coracles and Irish Curraghs: with a Note on the Quffah of Iraq". Nature. 143 (224). doi:10.1038/143224c0. ISSN 1476-4687. Retrieved 12 June 2018. ^ Badge, Peter (17 June 2009). The Coracles of the World (UK ed.). Gwasg Carrech Gwalch. ISBN 9781845272555. Look up coracle or coracles in Wiktionary, the free dictionary. Wikimedia Commons has media related to Coracles.